Despite the inherent risks, India is determined to join China, Bhutan, Nepal, and Pakistan in turning the Himalayas into the Saudi Arabia of hydroelectric energy. Almost 300 big hydropower projects are under construction or proposed for India’s five Himalayan states, according to the Central Electric Authority. 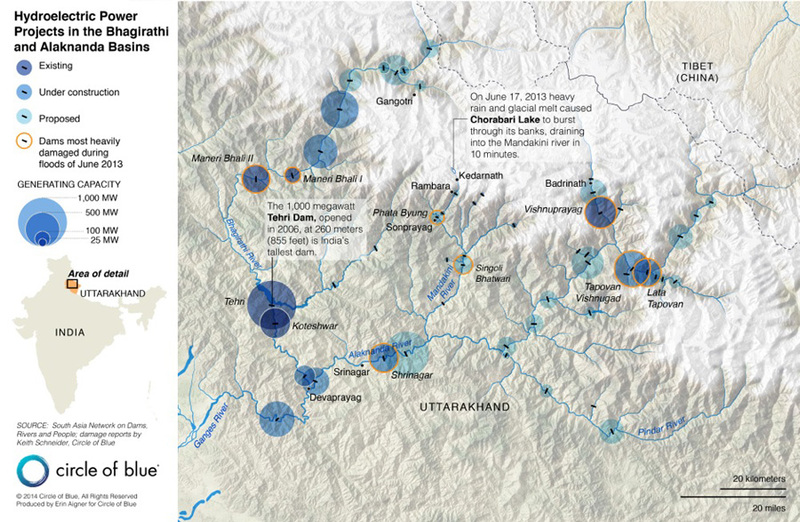 The most turbulent stretches of many Himalayan rivers are scheduled to support five or six new dams, one every 10 kilometers or so. That’s more utility-scale installations than are planned for the world’s other new hydropower production zones – the Rocky Mountains in British Columbia, the Amazon Basin, and the Andes mountains, according to assessments by power authorities in those regions. The Himalayas are still forming, still rising – producing one of the most active earthquake zones in the world. The fierce drenchings from annual summer monsoons erupt in regular flash floods that undermine the soils of vertical slopes, cause monstrous landslides, and episodically lay waste to big stretches of the region’s serpentine one-way-in, one-way-out highways. In a typical year, dozens of people drown, are buried, or swept away by floods in India’s Himalayan states. The unavoidable challenge that India’s engineers and contractors recognized but largely ignored, according to a flurry of government and university studies dating to the early 1990s, was whether the truculent mountain range would accept such intensive industrial intrusion. Late last spring, at the start of the heaviest monsoon season in memory, the Himalayas answered that question. On June 16 and June 17, 2013, the mountains unleashed two days of monstrous floods that killed about 6,000 people, according to estimates from the Uttarakhand government. Survivors and researchers at the Wadia Institute for Himalayan Geology put the death toll at 30,000. Some 800 battered bodies were recovered and 5,200 others were declared missing. The flooding wiped away at least six villages, buried dozens of others in mud, wrecked over 1,000 kilometers of highways, and dumped hundreds of buildings into the furious waters. The June flood also may have drowned India’s long campaign to diversify its energy production with big Himalayan hydropower projects. In the first of three articles for “Choke Point: India,” an investigation of global energy, water, and farm production trends conducted in collaboration with the Wilson Center, Circle of Blue documents that the flood seriously damaged at least 10 big hydro projects in operation and under construction in Uttarakhand. Another 19 small hydropower projects that generate under 25 megawatts were destroyed. The findings are based on Circle of Blue’s field reporting in December and January, state and national media dispatches, independent news services, and trade journal notices. We were assisted by the South Asia Network on Dams and Rivers, a non-profit advocacy group, and reports posted on Down to Earth, an online New Delhi-based environmental news site affiliated with the Center for Science and Environment. The Central and state government authorities, and private dam developers, have said next to nothing about the extent of the damage in news releases, on their web sites, or in public statements. Repeated efforts by Circle of Blue to reach business executives and government regulators by email and phone calls were ignored. The information blackout is so sweeping that even the website of the National Hydroelectric Power Corporation, the state-owned hydropower builder and operator, had until recently been offline for months. The 400-megawatt Vishnuprayag Hydroelectric Project, upriver from Srinagar along the Alaknanda River, was buried beneath 20 meters of rubble that also filled its water storage lake and likely wrecked the mouth of the penstock, the pipe that transports water to the powerhouse downstream. A second dam under construction on the Mandakini River, the 76-megawatt Phata-Byung Hydroelectric Project, washed away. The 99-megawatt Singoli-Bhatwari Hydroelectric Project downstream on the Mandakini, a major tributary of the Alaknanda, was so aggressively pummeled by boulders that big chunks of concrete were gouged out of its base and the patches of steel reinforcing rods of two support towers were bent like broken wheat. The powerhouse and turbines of the 330-megawatt Alaknanda Hydro Power Project in Srinagar were inundated with mud and silt just weeks before it was scheduled to begin operating. A landslide blocked the end of the water discharge tunnel at the 280-megawatt Dhauliganga project near the border with Nepal. The plug caused a backup that submerged the entire turbine room constructed deep inside the hill near the dam, causing at least $50 million in damage and a shutdown that has still not ended, said dam operators. 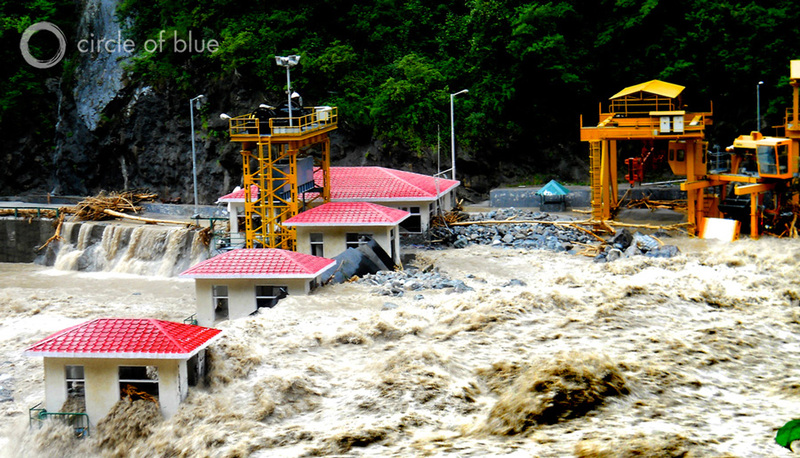 The Uttarakhand flood surprised India with its fury. Energy authorities in Asia and in North America have said the flood caused the most damage to a nation’s hydropower infrastructure since 1975, when rains from a typhoon overwhelmed the Banqiao Dam and 61 smaller dams in central China, killing 171,000 people. In the history of energy disasters, the Uttarakhand flood struck the global hydropower industry with the same force that the reactor meltdowns at Three Mile Island (U.S. 1979), Chernobyl (Soviet Union, 1986), and Fukushima (Japan, 2011) battered the nuclear power sector. India’s Supreme Court reached essentially the same conclusion. Last August 13, eight weeks after the flood, two Supreme Court judges, ruling in a case involving the 330-megawatt Alaknanda Hydro Power Project, issued an order that indefinitely prohibited the Central and state governments from granting any more permits for hydroelectric projects in Uttarakhand. The order essentially shut down new hydropower development in India’s 27th state. The Supreme Court’s intervention also came with a directive to the Ministry of Environment and Forests, the principal regulatory agency, to form a special commission to study the safety and merits of continuing with constructing dams in India’s most important hydropower state. The commission, appointed last year, is unlikely to issue its conclusions until after the national election results are announced in mid-May. Those findings, and their implementation, also are likely to be overseen by the National Green Tribunal, a four-year-old panel of senior jurists that rules on India’s big environmental cases. In August, two weeks after the Supreme Court order, the Tribunal said it would hear a case involving flood damage that citizens here in Srinagar said was amplified by the Alaknanda hydropower dam. The Tribunal also is monitoring repairs and construction at the damaged Vishnuprayag dam. The Tribunal’s presence is a clear indication that its jurists will closely follow other legal and regulatory aspects of the disaster. In December and January, the dry season in Uttarakhand, the Alaknanda and Mandakini Rivers were clear and blue with no angry crest at all. Yet both rivers, and several more affected by the June flood, reflected the grimness of what happened and the strain of what could easily happen again later this year. The road transport network has not been fully repaired. Transportation is so difficult, newspapers reported in December, that 1,200 tons of food could not be distributed and rotted in place. Hundreds of people are homeless. The gathering danger is not close to being lifted from Uttarakhand’s magnificent and hardened Himalayan valleys. So much silt and mud and boulders washed off the hillsides during the June 2013 flood that they filled the riverbeds. The rivers of the Alaknanda and Bhaghirati basin run now on new bottoms that are much higher – in some places 30 to 75 meters higher than they were before the flood, according to estimates by residents and the Geological Survey of India. Unless that rubble is removed, which amounts to a monumental and costly excavation project and has not started, the approaching monsoon season could easily overflow riverbanks and cause more flood damage to dams and communities this summer. India’s political leaders are determined to harness the power of water flowing down these steep mountain gorges. India estimates its hydropower generating capacity is 150,000 megawatts, more than all nations but China, Brazil, and Canada. Most of the new capacity was planned for the world’s tallest and most dangerous mountains range. But hydro generating capacity, now just over 40,000 megawatts or 14 percent of the country’s total electrical generating capacity, is growing little more than 1,000 megawatts annually, according to the Central Electric Authority. At that rate, it will take India a century to reach its hydro generating goal. The Himalayas, like a daredevil avenger, impede development and are exacting their vengeance with lingering seasons of menace. “Choke Point: India” is a research and reporting initiative produced in partnership between Circle of Blue and the Wilson Center’s China Environment Forum and Asia Program. Read the full series on CircleofBlue.org. Keith Schneider, who developed the Global Choke Point project, is senior editor and chief correspondent at Circle of Blue. A two-time winner of the George Polk Award and other honors for his work, he also reports on energy, agriculture, the environment, and policy for The New York Times, where he has served as a national correspondent and contributor since 1981. Sources: Center for Science and Environment, Deccan Herald, Down to Earth, The Economic Observer, The Hindu, International Rivers, South Asia Network on Dams and Rivers, Supreme Court of India, The Times of India, United Press International, Wadia Institute of Himalayan Geology. 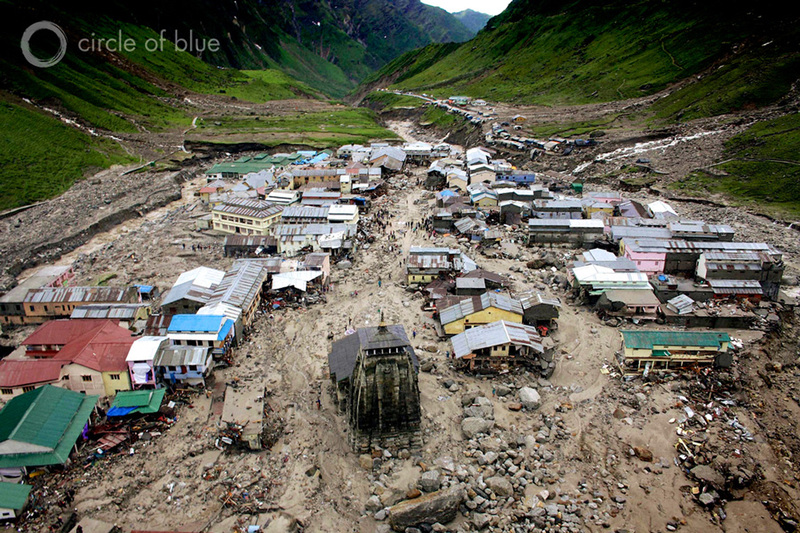 Photo Credit: Vishnuprayag Hydroelectric Project during the Uttarakhand floods, used with permission courtesy of Friends of Matu Jansangthan/Circle of Blue; Damage to Kedarnath, used with permission courtesy of Tehelka/Circle of Blue. Map used with permission courtesy of Circle of Blue. Video: South Asia Network on Dams, Rivers, and People.